The eye-watering sharpness of a pickled onion from the fish and chip shop feels like they’ve been steeped in jet fuel or paint stripper. It appeals to me in the same way sour sweets or extra-hot chillies do, almost a test of endurance. But there is pleasure to be had in bitterness. The sharpness of pickles cuts through the richest meat and it’s no wonder jalapenos in vinegar are a staple with nachos, or chutneys and sharp fruits go so well with roasts or cold leftovers. 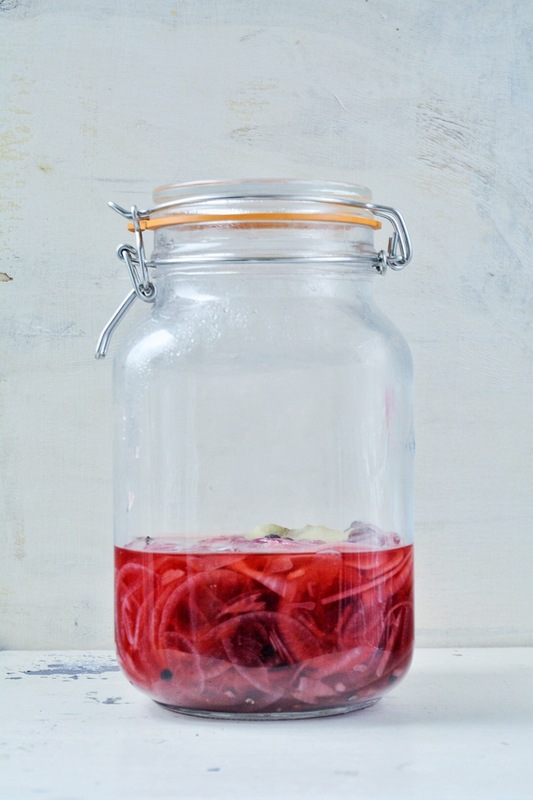 Here, I’ve made half a jar of red onion slices in white wine vinegar. Perfect for our weekly tacos with the children as a final topping and also finding its way into the occasional sandwich. It’s still important to sterilise the jar. But this is as easy as giving it a quick wash with hot soapy water and blasting it in the microwave for two minutes. Don’t forget to remove the metal parts beforehand though. Put the onions in a sieve and pour over a kettle-full of boiling water to soften and blanch them. Dissolve the sugar and salt in the vinegar and add the remaining ingredients. Put the onions in a glass jar and pour over the vinegar mixture. Leave for at least half an hour before eating but it tastes even better the next day. This keeps well for about five days. And goes brilliantly with fish and seafood as well as tacos.